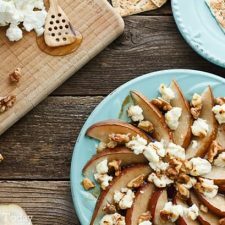 Fresh pear and creamy goat cheese bring a tangy-sweet balance of flavor when garnished with honey and balsamic for a simple, elegant appetizer. Heat oven to 375°F. Slice pear and arrange on an oven-safe platter or plate. Dot with goat cheese. Sprinkle walnut pieces over the pear and goat cheese. Bake for 10-12 minutes, or until cheese is lightly browned in spots. Remove from the oven and drizzle with honey and balsamic, as desired.